Odd it might seem, but the 2-1-0 record that the Washington Capitals posted in Week 5 was their first winning week since going 2-0-0 in Week 1. It was a welcome occurrence, even if the week was spent on the margin, all of the decisions coming in one-gpal games. It was a week with good signs and troubling signs. In that respect it resembles the four weeks that preceded it. The week opened with a 2-1 loss in Calgary against the Flames to end what amounted to a “The Good, the Bad, and the ‘Meh’” western Canada trip in which the Caps went 1-2-0. It left the Caps under .500 for the month of October, the first time that they were under .500 for an October since 2013-2014, when they went 5-7-0. 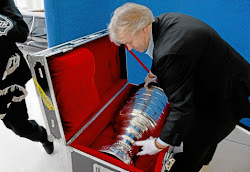 Coincidentally, that is the last time the Caps missed the postseason. They recovered to win the first two games of November, a 4-3 win at home against the New York Islanders and a 3-2 win over the Boston Bruins in Beantown. 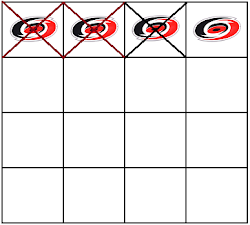 Keep this month in mind, for it is one in which the Caps can set the table for a good year. In the last two seasons, both of which ended in Presidents Trophy seasons, they were 9-3-1 (in 2015-2016) and 8-4-1 (in 2016-2017). Then again, they were 9-4-2 in November in that 2013-2014 season when they missed the playoffs. It was something of a disappointing week in the offensive end. Of the three teams the Caps faced this week, only the Calgary Flames, to whom they lost, 2-1, to start the week, could be considered a good defensive team (seventh in scoring defense at week’s end). The Boston Bruins and New York Islanders are bottom half teams in the scoring defense rankings, but the Caps did score seven goals combined against those teams, so it wasn’t a lost week in the offensive end. It might say something about the league that the Caps, at 3.00 goals per game at the end of the week, rank 16th in scoring offense. 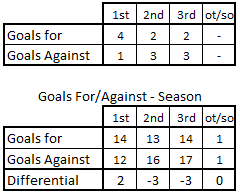 Last season, only seven teams finished the season with three or more goals scored per game. On an individual basis, the Caps spread their eight goals among six players. Lars Eller and Tom Wilson each had two-goal games, Eller’s coming in the Caps’ 4-3 win over the New York Islanders in the middle game of the week; Wilson’s coming in the Caps’ 3-2 win over the Boston Bruins to end it. Fourteen different players contributed points, Eller leading the way (2-2-4). Chandler Stephenson had a three-assist week to win the helper of the week award. Too many shots. The Caps are allowing too many shots. 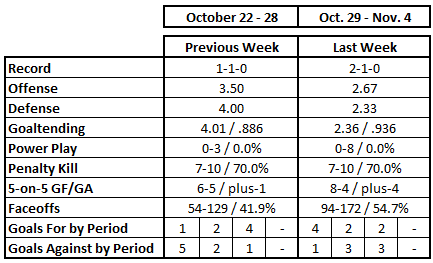 In Week 4 they allowed three opponents 109 shots in all and brought their streak of allowing 35 or more shots per game to four by week’s end. They have allowed 30 or more shots in 12 games. No team has allowed that many more often. Only Florida (nine times) has allowed more instances of 35 or more shots in a game than the Caps (eight). Ten times in 14 games through Week 5, the Caps were out-shot by opponents (including now the last five). They have a 5-4-1 record in those games. But this is not, perhaps, a team that can cope with those kinds of situations the way they did last season when, with a much more potent and efficient offense, they were 19-7-3 in games in which they were out-shot. Now Week 5 was more like it. Braden Holtby has had a decent start to the season, but not quite, it seems, the elite level he had the last few seasons. In his backup role, Philipp Grubauer struggled to open the season. Grubauer put together a fine, if unlucky, performance in the first game of the week, stopping 36 of 38 shots, but taking the loss in a 2-1 decision against Calgary. It was his first time in five appearances posting a save percentage of better than .900. Holtby got the last two games of the week and posted wins in both. His .929 save percentage for the week was offset somewhat by having to face 71 shots, but he was good when he had to be, especially in the third period against the Bruins, when he faced for Boston power plays and allowed one goal. He had a superb .966 save percentage at even strength (he is fourth in the league in ES SV among goalies with at least five appearances (.945)), part of a week in which he and Grubauer combined for a .957 save percentage at evens. Consecutive weeks without a power play goal. Now there is something you do not – or did not – see often from the Washington Capitals in recent years. Washington has now gone six games without a power play goal, going 0-for-15 over that span. It is their longest such streak since they went six games without a power play goal in Games 31-36 last season when they went 0-for-17. It was a poor effort all around. In addition to going 0-for-8, the Caps managed only 12 power play shots on goal in 15:47 in power play ice time. They did spread the shots around, eight different Caps recording at least one shot on goal, but none had any particularly high frequency. Alex Ovechkin led the team with three. They are doing themselves any favors in terms of opportunities, either. They finished the week with only three teams having fewer power play chances on home ice than they had (19) and ranking in the middle of the pack in road power play chances (tied for 13th) despite there being only one team having played more road games so far this season than the nine played by the Caps (Pittsburgh ias 11). 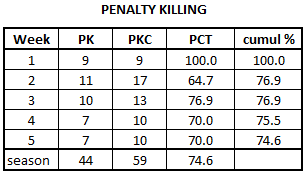 In a season in which several holes have been identified, penalty killing might be the Caps’ biggest weakness to date. After a perfect Week 1 in which they killed off all nine shorthanded situations they faced, the Caps have not had a week as good as 80 percent since. 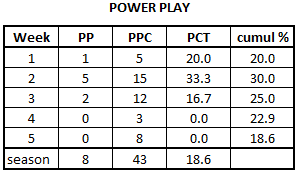 Week 5 was the fourth consecutive week in which they allowed three or more power play goals. They have allowed at least one power play goal in nine of their last 12 games. That they are 4-4-1 in those games is fortunate, and it suggests that if they can get their penalty killing in order, they can start to win games with more frequency. In Week 5 it was not so much a case of being especially inefficient, either. The Caps allowed opponents 15 shots on goal in 15:21 of shorthanded ice time. That shorthanded ice time is an issue, though. By the end of Week 5, the Caps spent more time killing penalties (96:27 in 14 games) than all but four other teams, and their minus-26:27 in special teams ice time differential was third-worst in the league and worst in the Eastern Conference. The Caps had a pretty good week in the faceoff circle, if a bit odd and uneven. They won the first and second games of the week against Calgary and the Islanders, respectively, before finishing under 50 percent against Boston on their way to a 54.7 percent week. The unevenness expressed itself in the Caps’ performance by zone. Good performances in the defensive (57.4 percent) and neutral (56.7 percent) zones was offset by a 47.7 percent performance in the offensive zone. Still, the Caps are 4-3-1 in games this season in which they were 50 percent or better on draws, 3-3-0 in games in which they were under 50 percent. 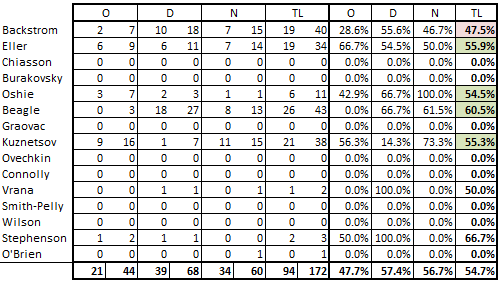 On an individual level, four of the five Caps taking ten or more faceoffs finished over 50 percent. Lars Eller (55.9 percent), T.J. Oshie (54.5 percent), Jay Beagle (60.5 percent), and Evgeny Kuznetsov (555.3 percent) were in that group. Only Nicklas Backstrom (47.5 percent) was under 50 percent for the week. The odd thing about Backstrom’s week in the circle is that he took only seven of his 40 craws in the offensive zone and took none there in the 3-2 win over Boston to end the week. Washington still has late-game issues in terms of allowing goals. They dominated the first periods of games in Week 5, outscoring their three opponents by a combined 4-1 margin. They were outscored by a 3-2 margin in each of the second and third periods of games, though. It could have taken a bigger chunk than it did, too. Calgary broke a 1-1 tie in the third period of the first game of the week to score what would be the game-winning goal. The Islanders scored a third-period goal to tie their game with the Caps before the Caps scored late to squeeze out a win. And, with a two-goal lead in the third period against Boston, the Caps allowed the Bruins a power play goal in the third period that made that game more interesting than it might have – or should have – been against an injury-depleted Boston lineup. The Caps finished the week in the bottom ten in goals allowed in the second period (16, tied for seventh-most) and in goals allowed in the third period (17, tied for eighth-worst). The Caps had a difficult schedule to open the season. Three back-to-back sets of games, the western Canada trip, nine of 14 games played on the road, not playing consecutive games on home ice. To that add the injuries to Matt Niskanen (limited to five games), Andre Burakovsky (nine games), and Brett Connolly (ten games), and a 7-6-1 record does not look so bad. Not that there aren’t issues. The offense is inconsistent, and the defense allows far too many shots. The special teams, with a special teams index of 3.2 percent, are having persistent difficulties. The silver lining is that if the Caps can get healthy, if they can repair their special teams, and if they can tighten things up in their own zone, they would be on much better footing. Then again, if they did all those things, they would be last year’s 118-point team. Chances are, they are not that team. Still, there is room – and the potential – for improvement. Week 5 was a step in that direction.